The contamination of critical areas is due in large part to transfer at ground level by shoes and wheels. The Cleanroom Flexi Mat is a unique, effective and cost-efficient solution to protect entry and exit points to critical areas. The Cleanroom Flexi Mat is specially designed for installation in critical settings, particularly in transitional areas such as cleanroom air showers. Transitions to other zones are not only made visible, but unwanted transferal of contamination is minimised. The particle retaining function is restored and maintained via daily cleaning. 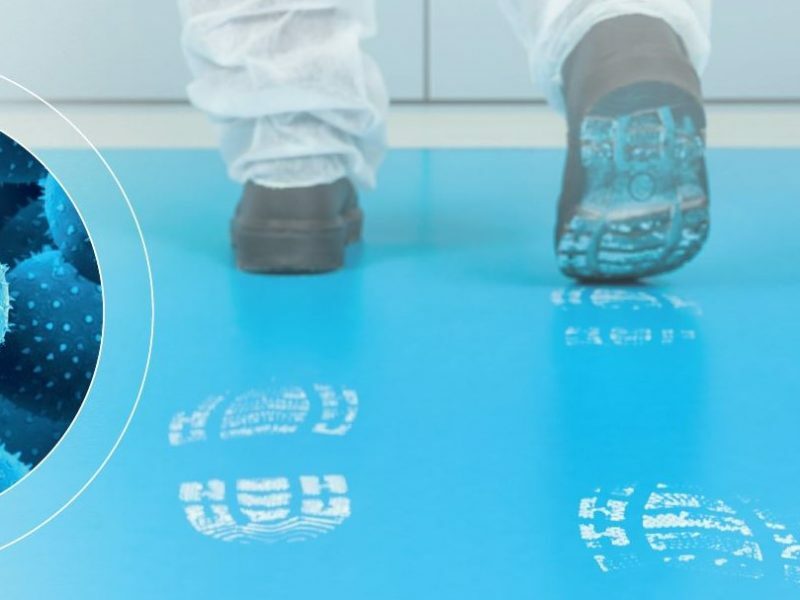 The Cleanroom Flexi Mat reliably prevents up to 99.9% of shoe soles, wheels and airborne contaminats from entering or exiting critical control points. Dirt, dust and bacteria are safely absorbed thanks to the high surface energy and adhere reliably to the mat. Demonstrable reduction of numerous organisms from Aspergillus to Escherichia coli to Salmonella, thanks to antibacterial coating. Available sizes: 60×120 / 120×180 / 180x300cm. The mats come in various colours. Reduced disposal costs: daily disposal not necessary with the Cleanroom Flexi Mat. No peeling off required – the Cleanroom Flexi Mat is self-adhesive: it’s applied directly to the floor surface and reliably adheres to up to six months. Suitable for standard thresholds – only 1 mm thick. Colouration makes transition to critical areas clearly visible. Adhesive function completely restored by daily cleaning.